Here I briefly explain the prupose and use of FSRaid. FSRaid is an application for working with so called PAR files. The main purpose of PAR files is to recover missing or damaged files. Homepage of FSRaid is: Fluid Studios. There you will find the most recent version of FSRaid. Ofcourse, you can download it at WeetHet too. The version number FSRaid can be found by starting the application and by clicking the "About" button. Where do PAR files come from? Applications like FSRaid, it's my favorite but there are more PAR applications out there, you can create PAR files. The principe s similar to that of a RAID disk system (see What is RAID? for details). A complex formula will be used to include individual bytes of an original file. The result of that calculation will later enable FSRaid to restore that missing byte and restore the missing file byte by byte. Let's consider a common example: say there are 100 files on a website or newsgroup that you want to download. A common example is a set of RAR files (often named with extensions like rar, r01, r02, etc.) In order to extract this archive, you’ll need every single file in the RAR archive set. If any one file is corrupt, your entire RAR archive could be useless – newsgroups are notorious for this. If the person distributing these files had made a set of PAR files and placed them online, your problems might just be solved. Just download the PAR files and place them in the same directory as your data files. If the number of PAR files is equal to or exceeds the number of corrupt files, then the PAR files can be used to restore the original files. Note: You will need at least the same amount of PAR files as you do miss files. So if you're missing 5 files, then you will need at least 5 PAR files to be able to restore the originals. If you have only 4 PAR files (in this example) then you will NOT be able to restore the missing files! The PAR files do not need to be in sequence, it's only the number of files that counts. So PAR files P01, P02, P03, P07, P09 will still enabe you to restore a maximum of 5 original files. Note: PAR files are usually number as such: PAR, P01, P02, ... etc. Note: When starting FSRaid for the firsttime, it will know so and ask you for some settings. Just click "OK" - you can change them later. It will also associate PAR files with FSRaid, so next time when you have some PAR files, you just double click it and FSRaid starts. When are PAR files used then? Mostly in Newsgroups (see also LeechGuy and Downloading movies). The poster didn't completed the uploads (yet). These sets of files are usually of the RAR or ZIP type. I.e. myfile.rar, myfile.r01, myfile.r02, etc. When extracting such a set of files, it usually result in a much bigger file, for example a movie, an application or maybe even a complete CD. One could use PAR files for securing backup files, however using it this way might be a bit cumbersome. How do I create PAR files? In the upcoming window, you click the button "Add files...". The filedialog allows you to select files and add them to the list. You can add files one by one or select multiple files at once. Once you finished adding files, you can set the recovery ratio. 10% is a nice ratio (FSRaid default). You can set this to a higher or lower evel if you like. Actually it's more of an indicator of how many PAR files will be created. You will have to use the slider to increase or decrease the recovery ratio. Below that slider, on the right, you will see how many files will be created. Creating too much files doesn't really make sense, so try to use a value between say 10% and 25%. Below the slider you will see a field called "Output directory" with a "..."-button next to it. Here you can indicate where the PAR files should be stored on your harddrive. Another field is "Base filename for parity set". This is the filename used for naming the PAR files. It doesn't need to be the same as any of the original files, however it does make sense to use the same name if all original files startout with the same name. This would make it easier to recognize PAR files of a particular set of files. Note: You can indicate if a file should or should not be recoverable. By default, files are recoverable (identified by [R] before the filename). Optional, you can set a file as non-recoverable ([N]). I can guess you question righ now: Why should I include a non-recoverable file? Well, I haven't got a clue on that, sorry. Now click "Create" to initiate the PAR creation process. Once finished you can upload the files (original files and PAR files) to newsgroups etc. How to restore missing files with FSRaid? First make sure the PAR files are in the same directory where you put the "original" files (usually the RAR or ZIP files). If you have started the FSRaid application before, then you will notice that PAR files are already associated with FSRaid. You just need to double click a PAR file and FSRaid will open automatically. If you haven't used/started FSRaid so far, then double click the FSRAID.EXE file. 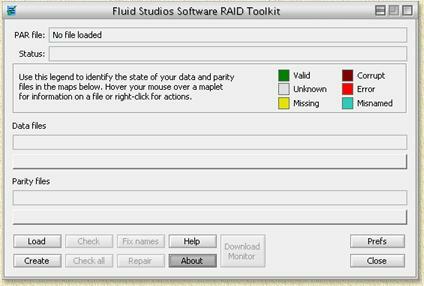 If you double clicked a file, FSRaid (depends on the settings) will run through the entire process of checking and fixing by itself, or you will need to initiate each action by hand. We assume the last one of these two and run through the process by hand. Firts of all: we will verify if all original files still have the proper filename. Click "Fix names" and FSRaid will do just this for you. Based on information the PAR file, FSRaid will identify files and rename them. Now we click "Check" so FSRaid will start verifying the files found. In the upper bar it will show the original files, the bar with blocks below that one shows the PAR files. You have all you files. Well, then you're done ... close FSRaid. You have enough original files and enough PAR files. Click "Repair" and FSRaid will start restoring the missing files. You're missing to much files. FSRaid will indicate how much files you are missing. Go get them (either the original files, the PAR files or a mix of these will do the trick) and try again.